Is the son of a carpenter, a hands on builder, and University of Colorado graduate (1975). He has worked in construction, remodeling, and embracing the renewable energy designs since Hawkeye Builders Inc. started in 1977. Pam & Martin, with a fresh marriage license in 1979, relocated to Durango to enjoy the four corners region and start our family. Although our two children have moved, graduated college and now married, we still enjoy living and working in the rugged and majestic landscape of the Southwest Colorado. Fine home building, woodworking, and home renovations, how we use of the sun and energy remain special interests. Past clients often contact Martin long after their projects has been completed and is relied upon for construction knowledge and experience. On a personal level, Pam & Martin have built and lived in 3 different homes in Durango (1980, 1988, and 2011). Our original passive solar home built in 1980 continues to have reduced energy consumption since its early days. Martin understands the building process and can relate to struggle between design detail, quality and allocating dollar amounts. In the Durango area the best views are often to the North & West which can challenge efficient designs. We can have snowy winters, drought like summers followed by monsoon rains so roof lines, how water moves in the building environment and drainage are carefully examined. Martin knows both the construction process and livability of healthy, safe, durable, efficient, and affordable homes. When not engaged in construction, Martin is often seen standing in the local rivers, an avid fly fisherman. He is an active participant and a former board member of our local 5 Rivers Chapter of Trout Unlimited. With Hawkeye Builders started in Boulder, CO in 1977 by its president, Martin D. Smith, you are getting a professional and skilled contractor. 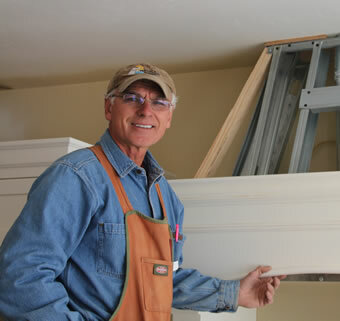 Adept carpenters and tradesman proactively work toward the success of your project. Our construction management emphasizes quality craftsmanship while meeting schedule and budget requirements. The Hawkeye Builders team is very knowledgeable of the various aspects of construction from concrete to cabinet crown molding. We have been part of many design build teams. Martin works with professional design teams. We assemble the design teams depending on the scope of the project and use the best possible tradespersons, which includes quality and cost, for your project needs. Hawkeye Builders is dedicated to providing integrity and high quality to all levels of work, with a vision of housing that considers the future. We advocate best choices of advanced building science, but realize it must be both affordable and sustainable. Our quality homes and remodels are well constructed,durable, have reduced maintenance and operating costs, and provide a healthy indoor living environment to the owner. Regarding green building and solar, we practice a common sense approach, using fundamentally healthy, safe, durable, and efficient methods with products best suited for our climate of Southwest Colorado. We offer site analysis for best building location and advocate resource efficiency and conservation of resources. Each client’s project is given our full attention and is driven by the client’s objectives. Client satisfaction is our priority. Attention to detail is present throughout the construction process: from the pre-construction phase, which includes developing the budget, confirming the scope of work and creating the schedule, to the construction itself where the quality of work, budget and schedule are monitored. Regular contact and meetings ensure that the entire project team (homeowner, contractor, architect/designer and subcontractors)are working together for the best result. Accurate, timely paperwork and communication is as important the success of the job as the quality of labor and materials. Effective communication allows us to serve clients from out of area or Durango. As a hands on home builder for over 29 years we have learned the value of building more than just homes. We also build relationships! We continually build working relationships with each project. We nurture and maintain valuable relationships with past clients as well as associates in the building trades. Past client relationships have helped improve our building methods and help future owners with the many decisions involved in building process. We contract with local suppliers and tradesman when possible to help our local community. Everyone benefits from this alliance. Hawkeye’s reputation is built upon the continued satisfaction of our local clients, not mass marketing or once a year ‘parade’. Okay, well yes we have won an awarded in the local Parade of Homes and some of the ranch homes are some of the most prestigious homes in the Durango area – but our only true objective is your personal satisfaction and truly enjoying your home! Past clients have contacted us long after their projects were completed to express ongoing gratitude, refer others and enlist help for new projects. We appreciate having strong relationships with our clients, many of whom have also become friends.